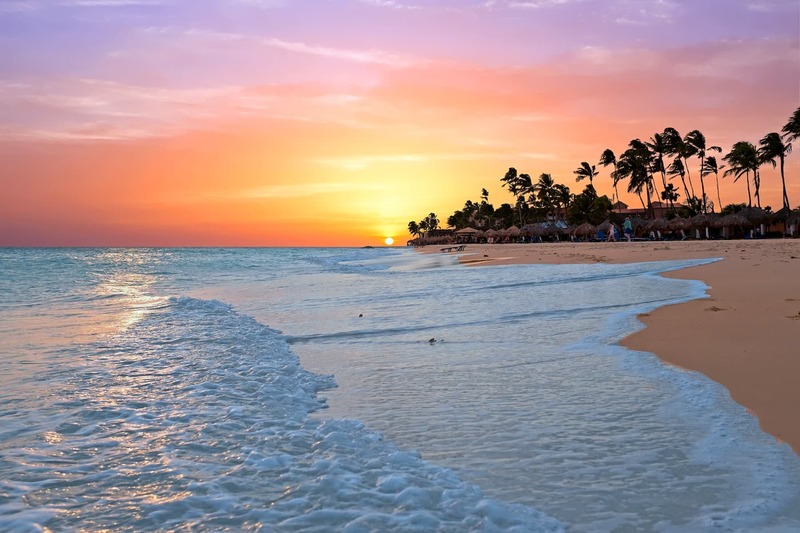 A gorgeous sunset at Druif Beach, Aruba, Dutch Caribbean. Swimming Conditions: Excellent, with calm waters. From the gorgeous Manchebo Beach, walk a few hundred meters south-east and the beach will gradually morph into Druif Beach (Grape Beach) that also belongs to the Eagle Beach area. Here too you will most certainly enjoy the epic vistas the Caribbean has on offer! Druif Beach is about 300 meters long and can get up to 50 meters wide, making this a great beach for walking along the coastline, although you may want to wear some sandals as the sand can get very hot. There are many low-rise hotels nearby as well as the Divi Village Golf Course. The food in the restaurants is good and varied, and the staff is happy and always helpful. The trade winds are usually constant at this corner of the tropical island, but comfortable. The swimming conditions are excellent as the waters are almost always calm. Soft white sand, clear blue sea – Druif Beach is yet another one of those postcard perfect Aruba beaches! Just seconds behind Druif Beach, you’ll find the All Inclusive Divi Village Golf and Beach Resort. This family-friendly Aruba beach resort features delicious dining options, exciting casino action, and a full-service spa. The resort offers full access to the other amenities and facilities at nearby Divi resorts on the island. Resort guests can discover 9 different restaurants, tennis facilities, and nightly live entertainment. The beach resort also features a children’s club and three swimming pools. Just a little up north, the renowned Manchebo Beach Resort and Spa can be found at Manchebo Beach. This is a luxury beach resort that features an outdoor spa, 3 restaurants with live entertainment and spacious rooms with a private balcony. The beach features multiple beach cabanas including lounge chairs and towels. Druif Beach is accessible by public bus, taxi or rental car. To get to Druif Beach from Oranjestad, just head northwest on Zoutmanstraat toward Arnold M Schuttestraat. Take the first right turn, then turn left onto Wilhelminastraat. Take the first left onto Arnold M Schuttestraat, then turn right onto L.G. Smith Blvd. Continue to follow Lloyd G. Smith Blvd. Go through the roundabout, then at the next roundabout, take the third exit onto L.G. Smith Boulevard/Sasaki Weg. Turn right onto Caya Punta Brabo, then turn left onto J.E. Irausquin Blvd. until you’ve reached the beach.